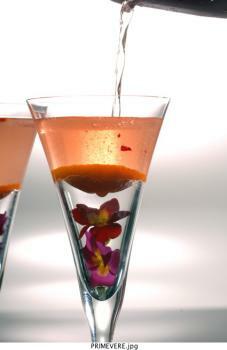 Method: In a champagne glass put 2 eatable flower of PRIMEVERE, then place a slice of orange to close the glass. 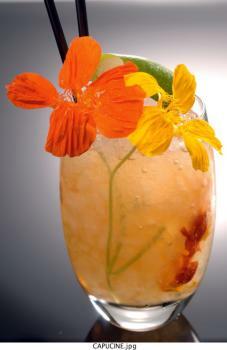 Then combine 2 1/2oz Floral wine (tariquet white), 1/2oz Monin Lavender Syrup into a tin with ice. Shake and strain into the top of the champagne glass. Method: In a tall glass muddle 1 slice of fresh ginger and 2 eatable flower of capucine. Combine 1 1/4oz COURVOISIER XO cognac, 1oz Ginger Ale and 2 spoons on Acacia Honey. Mix and fill with crushed ice. 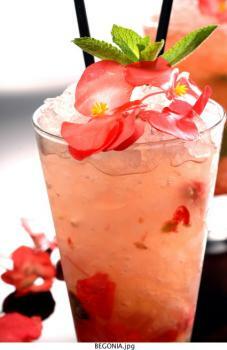 Method: In a tall glass muddle 3 flowers of BEGONIA, 2 spoons of brown sugar and 1/4oz Lemon juice. Combine 1 1/4oz Bacardi rum and 1oz Perrier water into glass. Mix and fill with crushed ice. Enjoy.